January contents: Seed orders are the main priority right now..... Why spend time NOW making a cropping plan?.... 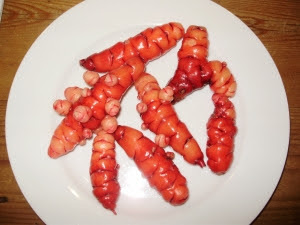 Why not try growing Oca this year?..... Another job for now is organising your seed sowing equipment.... Recycling saves money and avoids plastic waste.... A home made cold frame is useful if you don't have a greenhouse or polytunnel..... Grow some 'extra early' potatoes for Easter?.... Other jobs. 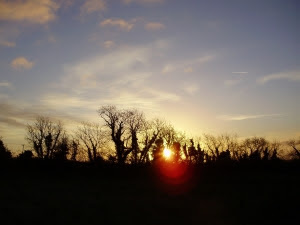 Sunrise on 1st January - the dawning of a new year, and a new growing season! One of the things I love most about gardening is that with every new year you get another chance to make a really fresh start. Dawn on the 1st of January is always so full of hope and optimism that this will be the best year ever! At the moment - there isn't much that can usefully be done outside - so now's the time to get on with inside jobs while you have the spare time - there won't be too much of that come March! If you try to do anything that involves walking on your garden soil - you will actually be doing more harm than good by compacting and squashing the air out of it. If you have heavy clay like mine - when it dries out it will turn into concrete! I've often been tempted to make bricks or a cobb house out of it - and I have in fact made small pots just to prove it! So keep to the paths if you need to do things! If you're growing in the traditional way on the flat - and you have to step onto the soil to harvest things like brassicas (cabbage family) and leeks - then get a wide plank to walk on in order to spread your weight a bit. This will minimize damage to the soil as far as possible. If you grow in raised beds - as I do - they're great because you can always work from the path without compacting soil at all. This is far better for all the soil life that actually needs air too. Raised beds are also a lot easier on the back, which does make life easier at this time of year. The well known rule is - if soil sticks to your boots or if you sink into it - then it's far too wet to work - so stay off it! Get on with some jobs you can do inside in the warm instead, like getting all your seed sowing kit ready, cleaning seed trays and pots, and ordering the last of your seeds if you haven't already done that - this will be a real help when the spring rush of jobs arrives! It's closer than you think - so it's really time to get on the starting blocks and be ready for action! Why spend time NOW making a cropping plan? A few months ago someone asked me - "if I could come up with a suggested rotation and cropping plan" for early in the New Year, but this is really something you just have to work out for yourself, other than the usual rule of not growing any one plant family in the same place more than once in 4 years. The main reason for that is to prevent pests and diseases or nutrient deficiencies building up. It's impossible for me to suggest cropping plans and rotations, as I don't know what you like to eat or what quantities you may need of any particular vegetable all year round. The basic four course rotation would be potatoes, peas and beans, brassicas, and then roots along with any others like cucurbits (marrows, courgettes and pumpkins) or onion family (leeks, scallions etc.). In practice it's almost always a longer rotation if you only have 4 beds - so 6 beds or more to accommodate the different plant families is probably more realistic. Growing lots of different varieties of veg is a good idea - 1. because it prevents you losing everything if a disease or pest strikes that particular crop. 2. because all the latest research shows that the more variety of plant foods we eat - the healthier our gut microbes are. 3. Obvious! It stops you getting bored and having massive gluts that you can't eat or process for preserving all at once! Planning also helps to give you an idea of how much seed you may need - so it's another job worth spending an hour or two on now. A minimum four-course rotation in the vegetable garden is vital in order to avoid the build up of pests and diseases, depletion of nutrients and also to improve soil . If you do a 'scale' plan of your veg plot on graph paper - doing that will also give you a rough idea of how much seed you will need for the amount of any particular crop you want to grow. This may seem a bit 'OCD' to some people, but it's actually very useful. If you only do it once really well, then you'll never have to do it in this detailed way again, as you can just look at it each year and simply move your crops around within the same rotation. Most seed packets will give you a rough idea of how much seed you will need per so many feet or metres of row, although I find they usually tend to overestimate how much you'll need - naturally - as they want to sell seed! And of course they also say "sow the seed into the ground......and then thin....." (thereby wasting seed!) Many beginners take this as gospel - sowing ALL the seed in a row - which often then gets wiped out by slugs before the gardener even got to see the seed leaves emerging! As I sow most of my stuff in modules of peat-free compost now, I find I need far less seed of most things - particularly lettuces etc. This is because I rarely lose anything to slugs or weather, as seedlings aren't planted out until they're big enough to be far more resistant to the odd nibble from any pests. The spacing for peas and beans do actually work out roughly the same as that mentioned on the packets. I love looking back over all the plans I've made over the years, and remembering particular crops I grew. I have most of my plans going back to the beginning of this garden here over 35 years ago now, along with a huge master plan of the entire garden. Dreams on paper! - Some happened - one or two others didn't. Trying to replicate the large garden where I grew up (as someone once said I was doing) was never really going to happen without extra help - but I've loved trying to nevertheless! Many disasters happened when I was just learning - but many successes too. The successes always spurred me on each year to do better. Experience is the best teacher - and it's very true that you always learn far more from your mistakes! If you haven't already done your seed orders - before you order any, just take an hour or so to organise your existing stock. Then you will know exactly what you already have and what you need more of. I’ve tried several methods over the years - but the one I find best is to put them into a sort of filing system - sorting them into groups: roots, brassicas, peas and beans, spinach, lettuces, salad mixes and oriental leaves, tomatoes and aubergines, squashes and pumpkins, herbs, lettuces, other miscellaneous etc. - in a similar way to how you would plan your rotations. I stand them up in large recycled fruit punnets or deep plastic meat containers, with a large cardboard label at the front of each punnet. This keeps them all together and makes each vegetable group or packet of seeds easy to find quickly. 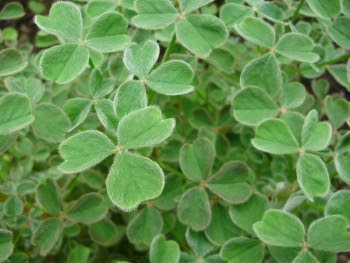 Why not try growing Oca this year? Colourful oca tubers like the ones pictured here are available from Real Seeds now - but as they're in short supply - order as soon as possible. They're a deliciously different member of the sorrel family - sort of 'lemony/artichokey' flavoured - and a good occasional potato alternative with fish and no problems other than rather ambitious territorial tendencies. They make a nice clump of the large tubers you can see pictured here. They also form masses of small tubers wherever the stems touch the ground - so just like Jerusalem artichokes - once you have them, believe me you'll always have them! I can't understand why they're apparently so rare, I have to weed them out in my veg garden now! I grew them a few years ago as a 'break crop' in the tunnel rotations and they really enjoyed it in there. I'm now weeding them out all the time in there too - but I can usually dig them up and give them away to grateful recipients! As they don't really tend to bulk up their tubers in late autumn though - it's best to grow them where they can be easily protected from frost. They're not too fond of containers either - they're much happier in the ground like most things. Although having said that - last year I tried planting them at the bottom of a container and then earthing them up as they grew. As they seem to form their tubers along subsequent stems - this worked well. One thing I haven't seen mentioned in any magazine articles or books though, is the fact that being a member of the sorrel family, they are actually quite high in oxalic acid - which accounts for the sharp lemony flavour of both the tubers and the pretty clover shaped leaves pictured here, which can also be used sparingly in salads. So rather than eating them daily, it's best to have them as an occasional treat, or you might end up with kidney stones if you're susceptible! There is some research currently being done into low oxalic acid varieties - but at the moment I definitely wouldn't think of them as a suitable everyday alternative to potatoes! We don't need to eat potatoes everyday either. There are plenty of lower carbohydrate alternatives that are equally as delicious - Jerusalem artichokes for one - which are incredibly healthy for your gut - being full of prebiotic Inulin which feeds your gut microbes and encourages them to multiply. When you've organised your seeds - you can then get on with ordering those you need as quickly as possible - many of the new or popular varieties will sell out quickly. Definitely do it by the end of this month if you don't want to be disappointed. Many of the seed companies also give a discounts for ordering early. Having my seeds organised in the way I've described is something I've found really useful over the years as it means I can keep checking my stock of seeds as I'm ordering. This stops me either duplicating or ordering too much. If you're anything like me, the seed catalogues all end up dog eared and marked everywhere with all the things I'd like to try. I then go through what I've already got - and after a major reality check (I don't have three gardeners - only me!) I then probably only order half or less of what I've actually marked in the catalogue. If I don't do this - and order online instead - I end up ordering far too much! Do compare prices too - it's amazing the huge variations for exactly the seeds in different catalogues. It's definitely well worth making the effort in these cost conscious days - and this month you have time to shop around! Order your seed potatoes too - then you can get them well-sprouted which gives them more of a head start when planting. Another job to do now is to organise your seed sowing equipment. Doing this while you have plenty of time is really useful and will pay off in terms of both time and money saved later. As you're filling your recycling bin - have a look to see what could possibly be used as seed trays, pots, seed labels etc. - you'll be amazed at how much money you can save. There are very few things normally regarded as 'waste' that can't be made use of for another job. It's far better than continually buying everything new which uses carbon intensive and increasingly scarce resources. I always have huge bags full of various plastic containers like yogurt or cream cartons - particularly those large 500g sized yogurt pots which are great for sowing peas and beans in. They save a lot of money as you don't have to buy expensive pots from garden or DIY shops. If you're careful and keep them in the dark when not in use so they don't degrade in the light - you can use them for years. I've still got some from a brand of yogurt my late mother used to like - and she passed away 17 years ago! If you need module trays, you can buy large amounts of different sizes in farm or horticultural growers supply shops in most areas. They will often split them and tape together lots of a dozen or so too, as they know that home gardeners are a growing market. The most useful size I think is the small tray of 12 x 1in/2-3cm modules. I sow most leafy things direct into these and they stay in those until planting-out time. I bought a huge box of 200 years ago, as that's the only way I could buy them at the time! They've actually made great presents for gardening friends - perhaps along with some precious, home-saved seed of a rare variety of something. Loo rolls of course make great long modules for things like sweet peas and even carrots or parsnips. I start off my early ones in these every year, as the soil is never warm enough for their germination at the end of January or early February, and you can plant out nice neat rows when the time comes - which is very satisfying.. Recycling saves money, and avoids plastic waste. And that means more money to spend on seeds! I have to make a confession here! - I AM that odd person who sidles up to strangers in garden centres and DIY shops just as they're looking at things like expensive biodegradable peat pots - suggesting that they don't waste their money on something that will only be of use once and encourages the destruction of our priceless, carbon-capturing bogs! I have to say the reaction is always good - I've never been told to mind my own business, but there will no doubt be a first time one of these days!! After all - who is averse to saving a bit of money - particularly at this time of year? I've actually made one or two really good friends that way too - gardeners are usually very friendly folk and naturally have a lot in common to chat about. A useful thing that you can buy from The Organic Gardening Catalogue UK (Garden Organic) and use for years is a small wooden paper 'pot former' in two sizes. These enable you to make your own biodegradable pots from old newspapers. It's quite fiddly and time consuming though - a bit like the gardener's equivalent of Origami - fun but not strictly necessary if like me - you've already got lots of recycled containers. Kids enjoy doing it though - and it's a good way to get them into gardening - which is never a bad thing! I also recycle any plastic containers which could be useful for growing things - they can last for years if you store them away from light when not in use. I'm still actually using recycled yogurt pots of a brand that my late Mother used to buy regularly, who passed away almost 17 years ago now. I have also been recycling many other plastic pots for over 30 years. The trick to getting them to last a long time is to keep them clean and out of the light when not in use. If occasionally one splits then it doesn't get thrown out - it's used as a sleeve inside another split one - making one strong, usable pot and avoiding more plastic waste. I still have some of the standard 2 and 3 litre pots which I got from a garden designer friend over 30 years ago! I raise my early potatoes in them every year as well as many other things, they're such a useful size. Speaking of recycling reminded me of this. If you don't a cold frame - you can easily make one using 2"x 4" rough timber and clear polythene sheeting obtainable pretty cheaply from builders merchants or DIY shops, or even from skips if you're like me! 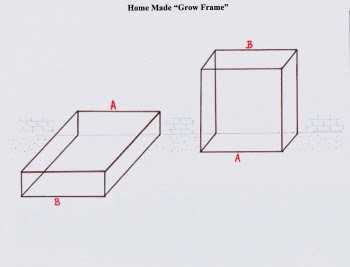 A home-made cold-frame can be made a lot higher than those normally available and then it allows you to grow taller summer crops which need protection too - like bush tomatoes and peppers etc. It's amazing the perfectly good stuff you see being chucked out when people are doing up their houses - my car is trained to automatically slow up on sighting a skip! They even wastefully throw away perfectly good windows and patio doors - ideal for sitting on bricks to make extra growing space! A friend of mine has made a whole greenhouse using old shower doors from people re-vamping apartments in Dublin. As she has a back problem ,ike me - she's also made some raised beds from old bathtubs from the same source. It does help that she has a son who works in the building trade though - and not everyone has that advantage! If you ask nicely and don't cause a mess - most people are often only too happy to give stuff away as it makes more room in the skip! And a nice pot plant or a few veg later in the year doesn't go amiss either! I made my very first large 'grow frame' - as I called it - by recycling some timber laths I'd found dumped. It lasted for 5 years until we moved and my 'other half' flatly refused to bring it with us!! (I suppose it was falling apart a bit - it was made from recycled timber after all - and believe me I'm no carpenter!) And I suppose after moving about three lorry loads of plants - as opposed to only one of furniture - it was probably just about understandable, although I really hate waste!! That scruffy old cold frame made from 'skip-found' bits and pieces allowed me to grow my very first tomatoes, peppers and aubergines (the best ever) against a south-facing wall in my first garden - and I learnt such a lot from growing in it! Sadly I don't have any photos from those days - I was far too busy raising very lively toddlers to think about such things in the pre-digital age - but I hope the diagram gives you an idea of how it was made! Even with polytunnels now - I still find a cold frame or two a very useful 'halfway-house', for hardening-off plants before they are planted out in the open garden. Grow some 'extra early' potatoes for Easter. You could plant some sprouted seed potatoes in pots inside in the next week or so for a 'super early' crop. This is the time when I start off my 'extra earlies' as I call them. They won’t need heat or light yet, as they won’t be up for two or three weeks, so you can start them off anywhere that’s basically frost free - and mouse proof! I usually do some under my large kitchen table! They won't need light until the tops emerge, but when they do - move them into your greenhouse or polytunnel and sit the pots on polythene, not on soil or anything they could root into, as the roots will come out of the bottom surprisingly quickly and root into whatever’s underneath - which will cause root disturbance later on when you lift the pots to plant them. They hate this and will sulk for ages if that happens! For the same reason use a good fibrous, peat-free organic potting compost to pot them in - not soil. Compost will hold together much better when tipping out of the pot to plan out - whereas soil would probably fall apart. Just put one seed potato in the middle of each 2 litre pot of compost about 2/3rds. of the way down - and cover it with compost up to the top. Do this before the end of this month and first-early varieties should be ready for Easter. They only need roughly 10 weeks growing time to have baby new potatoes ready to eat. 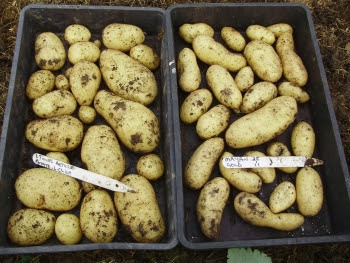 Lady Christl is the very best variety for doing this as it's the earliest bulking variety and can produce usable sized potatoes after just 8 weeks! I always save my own seed tubers from the previous year - but Lady Christl is widely available now. If you don't have any of your own early potatoes saved from last year - then you could look around in veg shops or supermarkets for any suitable first or second early variety which would have stored from last year. Take them out of the packs when you get them home or they'll sweat. Put them somewhere warm and dark (important as they'll start to sprout much quicker that way) like a box under the kitchen table for instance, and then in a week or so they will be well sprouted and you can plant them. Annabelle or Charlotte are very good salad potatoes which are quite happy to be grown this way,. I've seen them all in the shops just recently. When the tops have emerged from the compost, then put them somewhere in good light - like a polytunnel, or if you haven't got one - a cold frame - and cover with lots of fleece whenever it's very cold to prevent frost damage, uncovering if possible during the day if it's mild enough. In case you think this is a lot of faffing around - you'll be so glad you did it, when you proudly serve your very own new potatoes at Easter! Extra Early potatoes 'Lady Christl' & 'Mayan Gold'. Harvested late April. This is usually the month when your stocks of stored main crop potatoes may begin to run low - unless you grew acres of them. If you need some inspiration, then just think of new potatoes, with lashings of butter, in mid-April - yum! OK - so they're quite high in carbohydrates - but you can reduce their carbs and turn them into what's known as 'resistant starch' by cooking and then chilling them for at least 8 hours in the fridge, then reheating using whatever method you like. Doing this can reduce their carbohydrate content by up to 50% and make them more gut-healthy. But anyway - if you're not living on them all the time they can't do you any harm occasionally! They're also nutritious and the resistant starch encourages the good bacteria in your gut to multiply, which is good for your immune system too. If you're still worried about carbs, then just cut back on them in other areas of your diet so you can enjoy some new potatoes - they're one of life's great pleasures! I'd rather have them than sugar in my tea any day - and we rarely eat cakes or biscuits here, as healthy veg always come first! Another thing to check after all the wind we've had is brassica crops. Firm in - and stake if necessary - any which may have suffered from wind rock in the wet soil - and also keep them well protected from birds with some netting suspended above plants. The pheasants and pigeons here are getting very hungry and were using the netting like a trampoline before Christmas in order to weigh it down and peck at the Brussels sprouts through the top. I think it's definitely time for a few roast pheasant dinners! The remaining Brussels sprouts would complement them nicely and I'd really enjoy them - given the damage they do if given half a chance! I just want to remind you once again that if you leave freshly dug ground uncovered and open to the elements, as some thoughtless people do, our increasingly high winter rainfall will wash out and waste valuable nutrients, causing pollution of ground water, carbon loss and loss of soil biodiversity. It's best to protect the soil and keep it covered either with a growing crop, a weather proof mulch that can't leach nutrients in heavy rain, like wood chips, or a waterproof cover. This is essential at all times in winter when the weather's very wet! It's important to keep compost heaps covered too - for the same reason. The climate is changing, becoming much more unpredictable and definitely far wetter at certain times. We need to recognise this, be flexible and move with the times - not stick to outdated and old-fashioned modes of thinking from the last century! Double digging - as recommended in all the old gardening books is also definitely out - we now know that doing this breaks up important fungal threads and buries all the vital microbial soil life much too deeply - almost like suffocating or drowning them - so it can take years to recover. Soil life needs light and air too - and it's vital for growing healthy crops as it makes the nutrients in the soil available to plants. If you need better drainage - then make raised beds! For the last 35 years - I've practised what I call 'minimum dig' - or minimum cultivation gardening, in raised beds. I don't call it 'no-dig' - because actually no type of gardening is truly that - you still have to plant things and dig potatoes or other root crops! But of necessity, now that my back is deteriorating even more - I do as little work possible to get maximum returns - while at the same time protecting the soil's structure and it's whole ecosystem as far as possible. My co-workers are worms - they do most of the work! A healthy, nutrient-rich and vitally alive soil is the basis of all good organic growing. As I always say, look after Nature - and Nature will look after you! Thank you so much to all the people who have taken the time to write and thank me for my work - or thanked me on Twitter. I really enjoy sharing my original ideas and 40 years experience of growing and cooking my own organic food with you. It's most satisfying and naturally also very complimentary if others find "inspiration" in my work......But if you do happen to copy any of my material, or repeat it in any way online - I would appreciate it very much if you would please mention that it originally came from me, as it's the result of many years of hard work. Thank you.